Take advantage of various forms of picking, from alternate-picking to sweep-picking, and utilize vital nuances to yield the most complete proficiency. Build the strength and accuracy necessary to perform diverse legato runs and patterns, from basic to complex fingerings aimed at building endurance and strengthening dexterity. Perform multiple tapping techniques like pick-tapping, tap-slides, gallop-tapping and more. You'll find a range of simple to advanced applications and understand how to create unique licks in the process. Learn to manipulate the sonic atmosphere of music through natural, artificial, and pinch harmonics. Take it to the next level with your whammy bar, including some truly alien-like noises that would make Steve Vai proud. Bending and vibrato are among the two most important, if not THE most important techniques a guitar player can master. Much more important than speed or flashy tricks, a perfectly intonated bend with some sweet vibrato on the end is the most effective musical statement a guitarist can make. With an understanding of 4/4, you’ll possess the foundation to move forward and work towards other odd time signatures such as 5/4 and 7/4, and beyond. 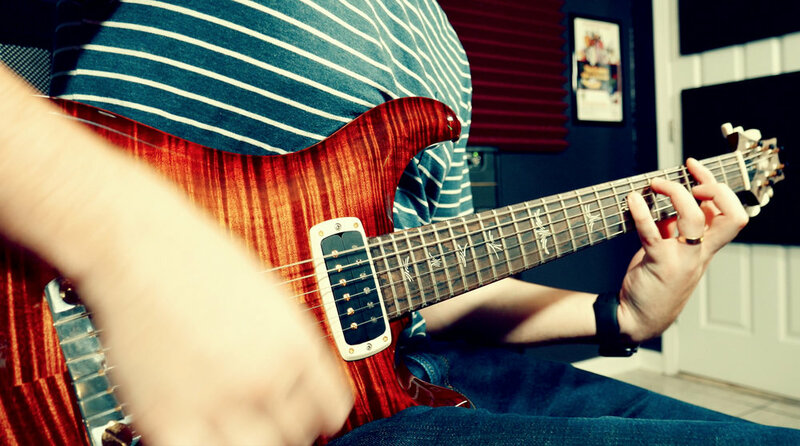 These lessons will fill in the gaps to cover important parts of rock guitar playing that are a bit more abstract, such as practice methods, defeating guitar discouragement, tone tips, and much more. This is a treasure chest of great information, so return to it often!